Viktoria Minya. Photo possibly by Cseh Gabriella. Source: Viktoria Minya FB page. What’s it like to be a professional nose? How difficult is it to become one? How does one deal with the restrictions inherent in perfume creation, whether IFRA/EU-related, a client’s brief, or basic price constraints? And why do so many perfumes smell the same?! 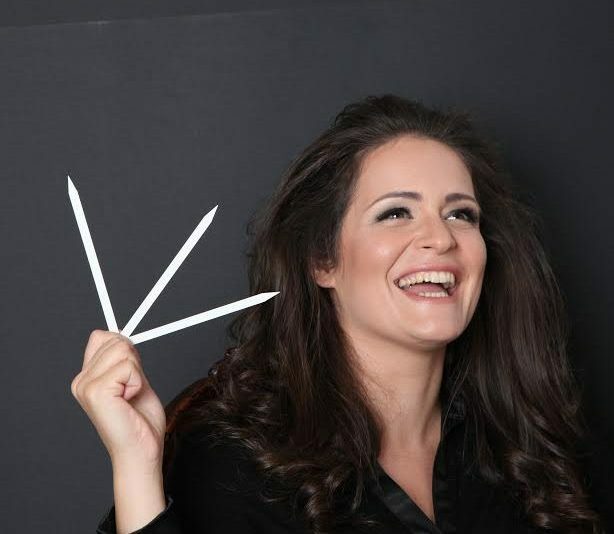 Those are a few of the questions I posed to Viktoria Minya, the award-winning perfumer and owner of Parfums Viktoria Minya. She’s a rare creature in the industry for a few reasons. First, she’s one of the few professionally trained female noses who also runs her own perfume house. Second, she’s both an insider and, in many ways, an outsider as well. She’s not part of the stable of perfumers hired by the big companies like Givaudan, IFF, or Robertet, but she was one once. Now, she’s independent but, unlike Bertrand Duchaufour, she’s not a nose for hire in the typical sense and she works primarily on her own creations. Her closest counterpart might be Patricia de Nicolai, but the latter is arguably a part of the establishment, whether through her presidency of Osmothèque or her membership in the Guerlain family. Viktoria Minya. Photo: her own. 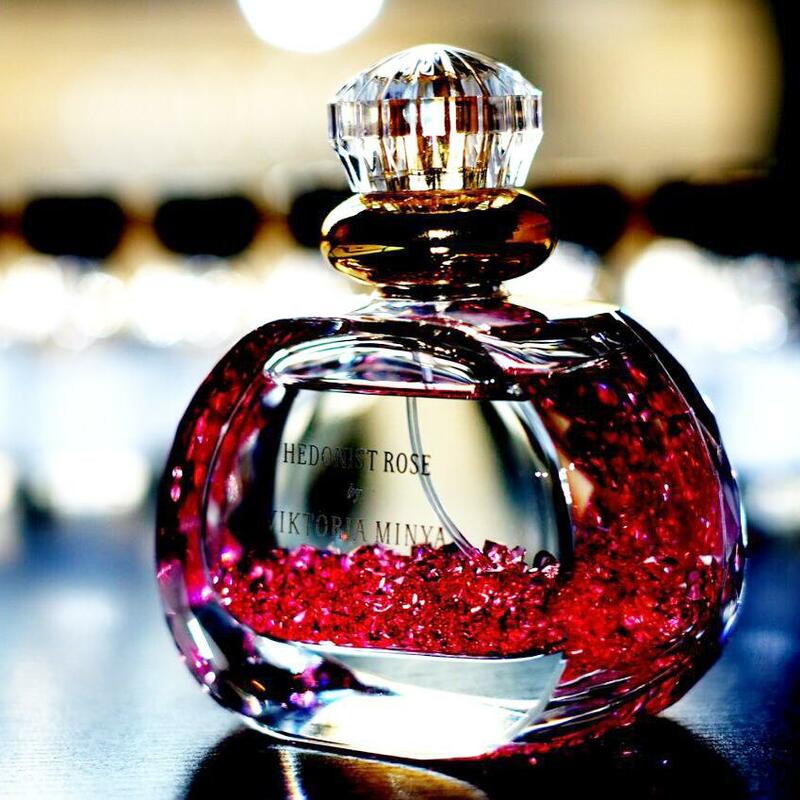 Ms. Minya has no such ties to the old-school bastions of perfumery, and that may be why she speaks with such refreshing candour in this interview. In the past, when I’ve met or spoken with her, she’s never had any interest in perpetuating the myths and secrecy of the industry, even once comparing it to the Wizard of Oz, an ordinary man hiding behind a curtain. It’s a rare insight into the industry and how it operates, but Ms. Minya also talks about other issues involved in being both an independent niche perfumer and a brand owner. 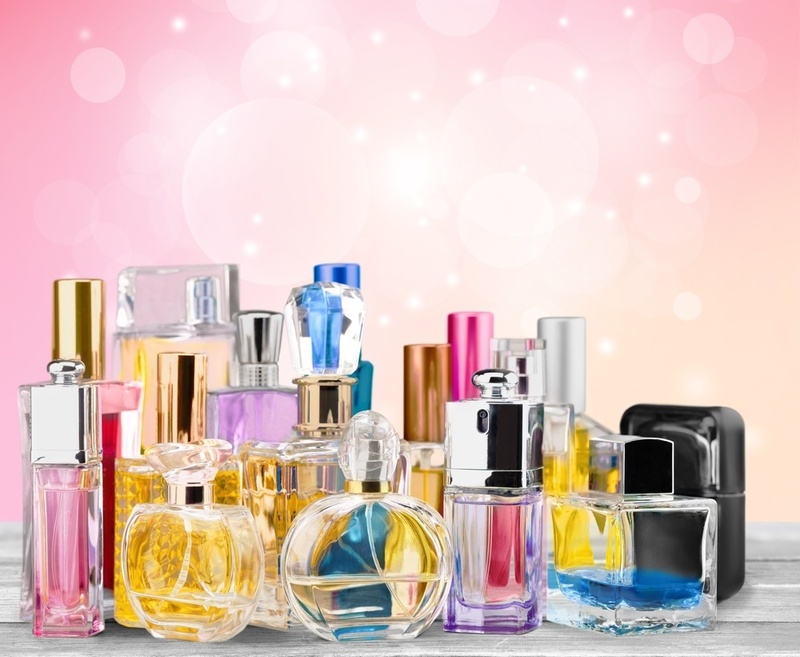 It’s not merely the well-known IFRA/EU restrictions on materials, but even mundane considerations that you or I might not think of, like navigating trademark monopolies to find an original name for your perfume. Ms. Minya talks about all that and more. I’m incredibly grateful to her for giving so generously of her time and knowledge but, most of all, for being so honest. It’s such a breath of fresh air in this heavily hyped world where everything seems to be driven by PR, marketing, hype, and illusion. I hope you find her words to be as illuminating, informative, humourous, and impactful as I did. I’m very interested in your perfume journey, starting with your professional perfume education at the Grasse Institute of Perfumery (“GIP”). Only 12 promising students are chosen at a time, and you were one of those. 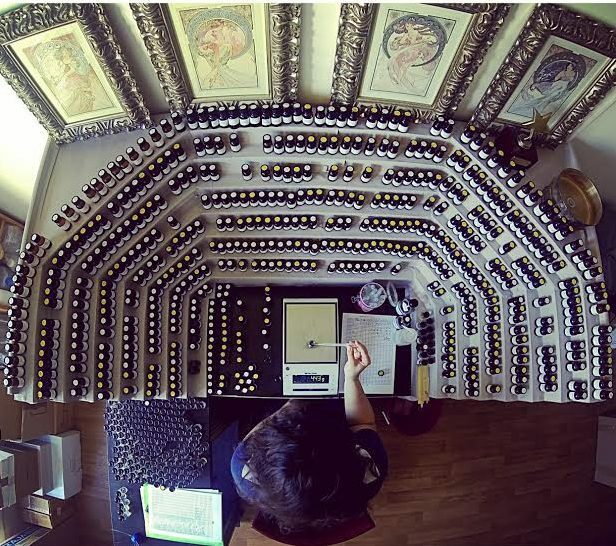 The GIP website states that there are 972 hours of training, of which 324 are given by perfumers or experts. The remaining 648 hours are spent doing supervised practical work. A 2009 newspaper article about the Grasse Institute called “Smelling like roses… or not” (which briefly talks about you) explains that students had to memorize around 500 raw materials. Can you elaborate on the process, its stages, and what exactly was involved? What were some unexpectedly difficult notes to memorize? Did you have an easier time with naturals or aromachemicals? The school is amazing, and I really recommend it to those passionate perfume-lovers who feel like taking a further step into educating themselves in perfumery! The first week, I remember, we were completely “drunk” from all the scents we needed to smell. We actually simply started smelling all the most important and most used molecules and natural ingredients that a perfumer works with. Apart from olfactory classes, we did review all the “classics” of modern perfumery history, and evaluate them note by note. We had Chemistry, Marketing and Law courses as well. 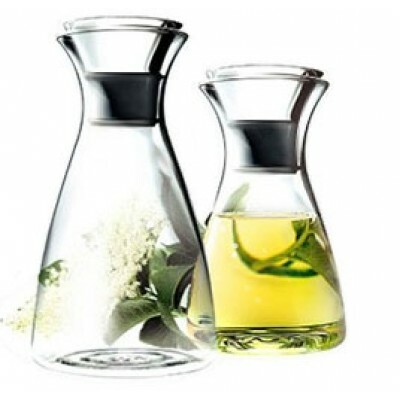 Not only we learned how to do fine fragrances, but we are taught to do perfume creations that are adapted for functional perfumery, such as shampoos, candles, and so on. As for difficulties, I personally had a really hard time to “understand” aldehydes. They are very strong notes, so I had no trouble memorizing them, but I couldn’t link it to any of my experience, memory or feeling, and that was really weird, my body has no emotional reaction to it, whatsoever. Naturals are easier to learn, because you know, you can actually think of a specific plant/flower/spice which of course is very helpful in memorizing. According to the GIP website, the curriculum covers everything from perfume regulations (like EU/IFRA rules), to gas chromatography and mass spectrometry analysis. Obviously, you learnt perfume composition and blending as well. Do you remember the very first things that you put together in a beaker, and what the end result was like? Was it hard to learn about precise proportions, or any of the more chemistry-related aspects? What were some of the challenges and what were some of the easier aspects? I think I was the first in school to actually try to create something on my own. 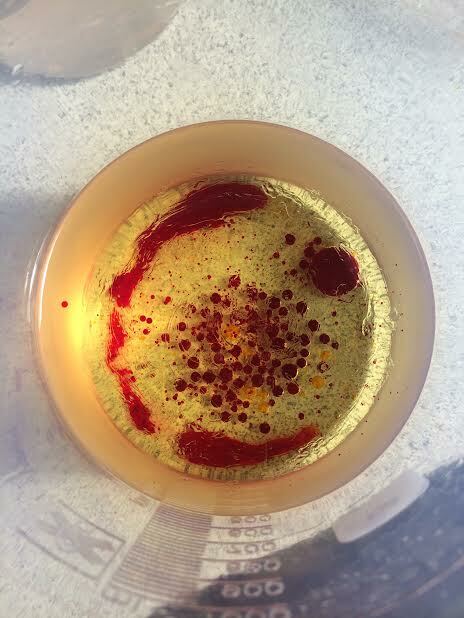 I just started to put random raw materials in a beaker, I remember vaguely rose, osmanthus and patchouli – the end result was actually surprisingly good!! Then and there, I learned a life lesson to always note down the formula of any creation, cause no matter what you think, you will NOT remember all lines/exact quantities. 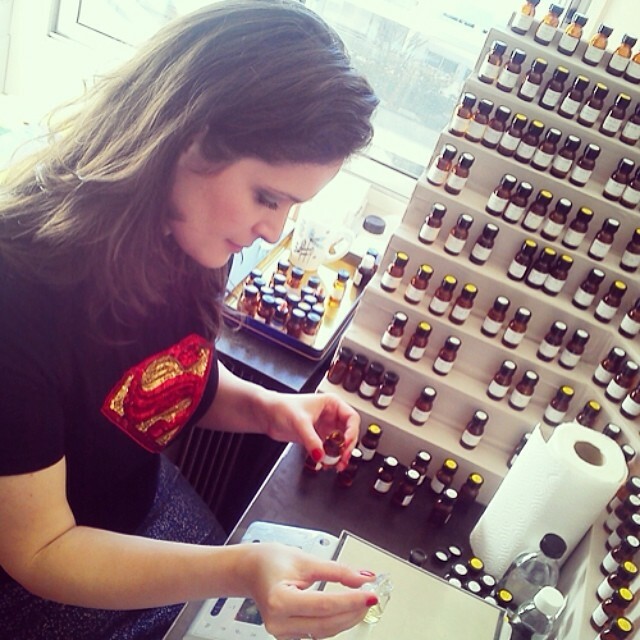 One of the big challenges of a young perfumer is the actual weighting the formula, the recipe of the perfume. It needs a lot of concentration, and of course precision is of key importance! I am still amazed how much a tiny – tiny – drop too much of a soft smelling ingredient will take out of balance the whole composition! Every perfumer needs to pass by the experience of an Assistant Perfumer, who often would just weigh formulas the whole day. It is a very (both physically and mentally) tiring experience! I remember my first internship as an Assistant Perfumer, I was unable to finish a complicated formula, I made mistakes non-stop and had to restart at least 5 times. Most frustrating first day, ever! The newspaper article states that students are required to take an internship after their studies are completed. Where was yours? Can you elaborate upon what life was like there, what you did, and what sorts of things you created? Grasse is famous for being the cradle of modern perfumery, and as a result, there are about 60 companies in the region concentrating on the perfume industry; I worked for a middle-size perfume creation firm, I started as an Assistant Perfumer and slowly they would invite me to participate in creation projects as well. Creation requests were coming from all over the world, but many of our creations would be sold in Middle-East. I also had evaluating projects, which I also really liked, clients would send us juices from all over the world, and I needed to take an intelligent guess to find what the unknown juice resembles the most from the company’s “scent library” which included at that time about 10,000 references. I remember imagining myself an olfactory Sherlock Holmes during these projects. 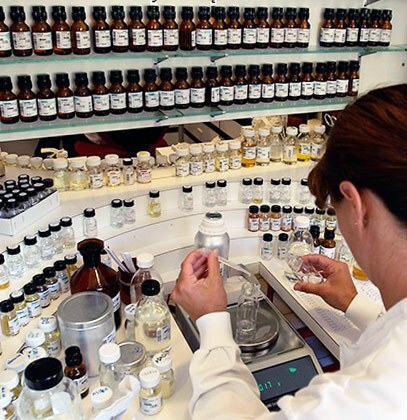 A lot of perfumers go to work for the big aromachemical giants, like Givaudan, IFF, or Firmenich, and become part of their stable of talent. You’ve chosen to become an independent perfumer and to start your own house, Parfums Viktoria Minya. In an interview with Fragrantica back in 2013, you said that one of the key issues which influenced your decision were the cost-restrictions placed upon noses at the large “perfume creation companies.” Was there anything else about the corporate perfumer life that you didn’t enjoy and, if so, what? Indeed, typically in any house, a perfumer has to work on perfumes that were maximized in price per kg, so we perfumers use software that calculates the price during the formulation. It is really frustrating! 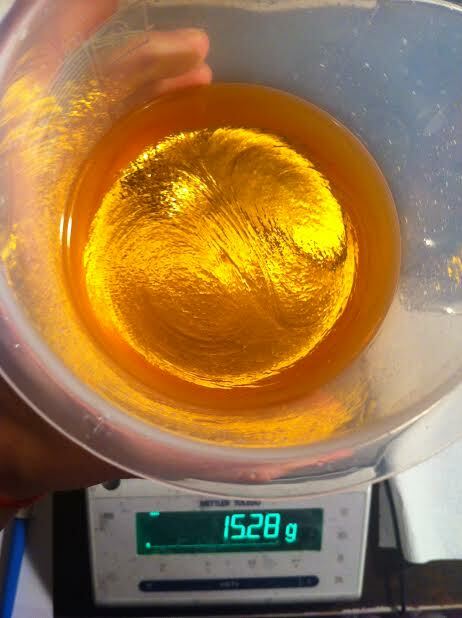 I would have to calculate the price of every gram of an inspiring ingredient and more often than not, realized that I could hardly use a drop of gorgeous naturals like rose oil or iris butter, just to name a few. I wanted to make sure that I am working in an environment where I could use these fabulous materials without crazy limitations, and the only way to do that was to create my own company and decide for myself what creation requests I answer and what I decline. This is a luxury I insist on affording to myself. As much as I hated the restrictions, it did teach me to formulate really well, even with price or IFRA or other restrictions. I would say it was a great experience that probably taught me more technically than I thought at the time, and I worked on many interesting briefs, too. A brief would typically come in saying, XY company wants to launch the newest scent for 2017, let’s say. The target audience is precised as well, men-women, plus age group. They would tell us what impressions they wanted the clients to feel when smelling the perfume; there were not many variations, to be honest, like “sensual,” “mysterious,” “elegant,” etc. More often than not, to give more guidance to the perfumers and to avoid misunderstandings (everybody has different olfactive references linked to feelings), the brief would tell us which perfumes they think are in the same group as the desired new fragrance, and also they list a few that they don’t want the new fragrance to have anything in common. The brief would also say which materials to use, and which not to use at all. The last part would be about the price and legislations; which regulations to follow according to the geographical scope of the future sales. The funniest, though, is that every single brief I have seen in my life mentions that they want something totally new, and something extreme, and something that the world has not seen – and then they would often go on and pick among our propositions the one that smells the closest to J’adore. I quickly learned that these companies really don’t want anything new, they want to take no risks in being the first to test the people’s taste in a very unique fragrance. There wasn’t any other part in the work that I did not enjoy. On the contrary, I like sharing my work, so it was difficult for me to suddenly start working alone in the beginning of my independent perfumer adventure. Starting an independent perfume house is complicated. What were those early days like for you? What were some of the practical, logistical, or business issues that you had to deal with? 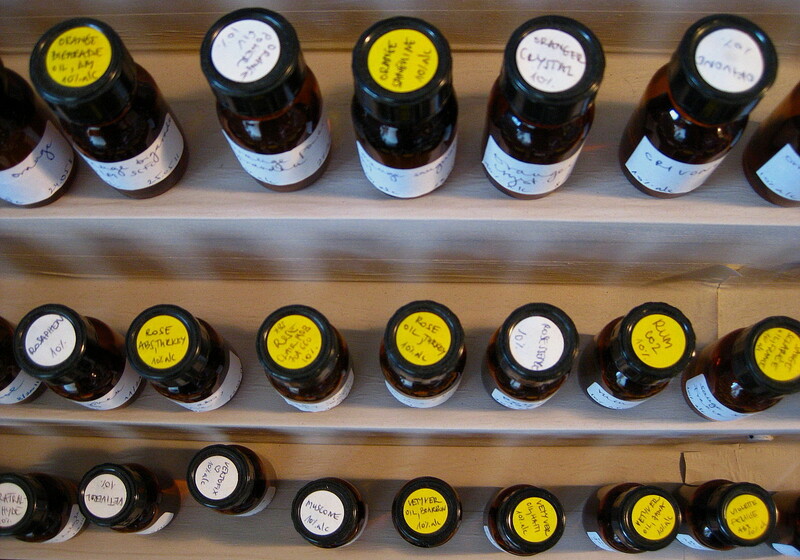 Were there any unexpected challenges in starting to produce your own fragrances? As I mentioned, the beginning was very lonely! I used to work alone in my “lab” which meant really a table in my studio in Grasse, and sometimes I would not go out for days from my apartment, because I got so much into creation that I would work in the middle of the night too, then wake up late, and have a completely different schedule than normal people. Viktoria Minya’s Hedonist Rose. Photo & source: Parfums Viktoria Minya Facebook page. I also had huge decisions to take at that time, like choosing the name of my perfumes, which is much more of a deal than you would think. At least, it was for me – especially because there was a period in the 1980s when multinational companies trademarked a massive amount of interesting expressions, words, that could be potential perfume names in the future, not leaving too much choice for future generations! Imagine every possible word that could be related to perfumes, it is already taken! I think this is the reason that nowadays, there is a lot of numbers and common nouns which are used in perfumery, because numbers (with the exception of No. 5 which is for Chanel!) cannot be trademarked, same with flowers, like “rose”,“sandalwood”, “lemon,” etc. I am convinced that this is also the reason behind flankers of the big perfume houses – it is just easier to use the same name with an extra word (like Sensual, Intense, Extrait, and so on) than trademarking a new name that is available worldwide! Returning to your question, though, I never thought in my life that I would end up owning a company, so I never knew how this worked administration-wise. France is known to be extremely bureaucratic. I can confirm this applies to registering a company as well, let alone maintaining it! I suffered a lot! What are some of your favorite notes in perfumery? What are the ones to which you are not drawn? And are there any materials that you often find tricky to handle, perhaps due to how they interact with other elements or the way they might overtake a composition? Essential oils on Viktoria Minya’s perfume organ, distilled in 10% alcohol. You can see various types of orange-related oils on the top shelf, rose on the middle, and things like vetiver on the bottom. Click to enlargen. Photo: my own. It tends to change a lot, but I love all the citruses, mostly Mandarine perhaps. It brings me to a “Christmas-mood” no matter which month we are in the year! I also adore vetiver from Haiti, most woody notes and musks, but I can go on forever, so it is easier to say which ones I don’t like: I have a hard time with Estragon oil [ed.’s note: Tarragon], which is green and sweet in the same time, and it literally is the only scent that causes me nausea. I don’t have a problem with real Estragon, just its essential oil, which is weird. As for difficult notes to work with: Ginger is known to be a though cookie and until recently, there wasn’t really a great quality ginger essence in the market. I mean there is all kind of ginger essences, and I am sure a lot of effort is put into making them, and for sure from great source, but they all have a fatty aspect in the drydown that I always hated! Recently I found other products made of ginger with CO2 extraction, which are really expensive but amazing to work with, as they don’t have this unpleasant tone during drydown. Talk to me about “Mods,” the industry term for the various versions that a perfumer goes through in creating a scent. What is your process like, in terms of what happens from one version to the next? How has your methodology changed since you first started? Finally, what fragrances have challenged you the most in terms of the number of “Mods” you went through before you were satisfied with the end result? 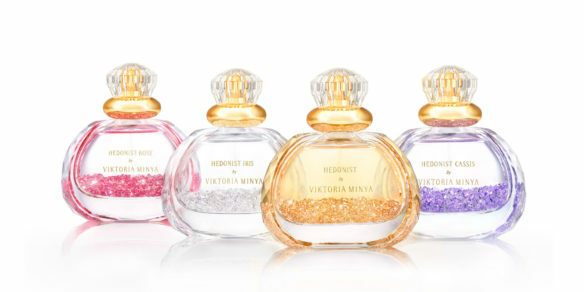 Photo: Viktoria Minya Parfums Facebook page. I imagine this to be very different to each perfumer, but my creation process starts always with an inspiration, which could be triggered by anything: a person passing by me during the day, a nice quote, a vivid color in nature, a dream – literally it could be coming from anywhere! It starts to take its place in my mind, and within days, or weeks, it starts to pressure me from inside. It is not a bad stress though, not an anxiety kind of feeling, but I would actually feel it in my veins that it is time to sit down and write up a formula. After that, the real work starts, many hundreds of trials, fine-tuning the perfume, so that it is the closest to the one I have in my “head” or nose if you like. Sometimes, you take turns that leads nowhere and then you go back to trial number one and continue from there – sometimes what you created turns out to be horrible on skin, so you have to take into consideration that as well! It is a very mentally challenging process and could be quite frustrating at times. And then, sometimes after hundreds of trials, the changes become so tiny that they are only one realizing the difference between two consecutive trials, and soon you realize that you are turning around one final formula, that you just don’t feel like changing anymore at all – this is how I know the juice is ready! As an EU-based perfumer, you are subject to EU laws on everything from the ingredients you use to the packaging of your creations. I’m curious about the more unexpected ways in which the regulations have impacted the process, beyond the obvious oakmoss restrictions? Have you experienced any unexpected complications or challenges in creating your four fragrances and, if so, can you elaborate on them? One of the most difficult thing about the IFRA guidelines is that they are changed or at least updated every 2 year. This is extremely hard to follow up, if anybody decides to create according to their directives. Since molecules are being restricted or banned from the original perfumers’ palette, we have to find replacements to these materials, which are very, very different from the original stuff. 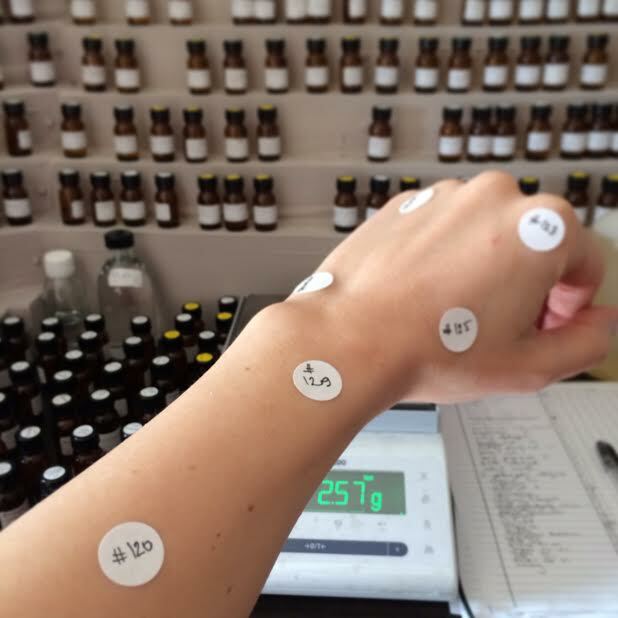 So it is really time-consuming to recreate formulas which match or fit the requirements, while also smelling the same — and this is a really technical part of a perfumer’s work, namely how to get the same exact effect but with restricted elements. Every perfumer has learned in school how to recreate a scent from third of its price, and we tend to treat this exercise with disgust, because nobody wants to do cheap stuff, but it is a very useful training when it comes to EU directives, even though the objective is not to decrease the price at all. Again, as much as I am against any limitation of the perfumed products (though I am for a more extensive sharing of related information), this is a rather interesting game and an intellectual challenge. Just imagine, you have a painting that needs the color orange, and you realize you don’t have orange anymore, but know that yellow and red will give orange anyways. But, also, in perfumery, sometimes “yellow” and “red” are restricted, too. Obviously, this is a very simplified example, but still, good luck to us! You offer bespoke perfume services, in addition to offering to recreate a beloved fragrance memory from the past. Could you walk us through the process, and how exactly you go about it? What is your favorite scent that you’ve created for someone else? Are there any challenges in creating custom perfumes for a client? Usually, I would meet with a client in my lab, where she would come with one particular idea in his/her head that he/she wants to “put into a bottle.” Often they are very romantic memories, like meeting their love the first time, or the day of their marriage, etc. We would go through all the materials that could be a match for their memory – fortunately everybody comes with very precise ideas in their minds! Within a period of 3 months, I am coming up with one or two trials that are sent usually by post and we discuss the end result over the phone. It is amazing what strong emotions could be “revived” via a tiny bottle of perfume! Custom perfume creation with a client. Photo: Viktoria Minya. There was a particularly interesting story with a French actress that I used to work with. She came to me as all her life she reacted with a great deal of emotions to any olfactory stimulation, and she thought she could use this more consciously as a preparation in her work. We went through a lot of raw materials just to see how she reacted to them, and it was extremely interesting to see what a simple rose oil would trigger in her. After about an hour of sniffing and talking together, we found that there was one particular ingredient that immediately caused her a strong mood change, for the worse. She had a childhood memory coming back to her, as a reaction to this ingredient, which brought up loneliness and the feeling of not being able to defend herself. I was really worried for her and I wanted to comfort her directly and stop the experiment, but she insisted on holding the vial in her hand and sniffing it strongly, as if she wanted to relive the experience fully consciously again. We talked about it afterwards for hours and I was so scared to let her go with confused feelings, but she told me this unexpected childhood memory and her dealing with it consciously brought her more inner peace than any mediation tool she used in recent year. She ended up using this experience in her next movie, and she was largely praised for her interpretation of that specific role. You also offer perfume workshops and classes where you teach everything from the main olfactory families to raw materials, perfume accords, and composition. Have you noticed any trends in terms of what students pick up most easily and what they struggle with? What advice do you have for people who want to learn perfumery but don’t have the opportunity to take classes with someone like yourself? What steps should they follow on their own? Teaching is really fun experience, as I get to see a lot of passionate perfume lovers that appreciate every single new information they can gather about perfumes, and I got to know a lot of amazing people via courses/workshops. Classes are a bit more intimate, as we spend many days together, so the connection is really intense. I tend to have requests from students coming from abroad for an intensive 4/5 days course during which I share the basics of perfume-creation including the study of naturals/synthetics, accords, evaluation, and creation. I don’t want anybody to misunderstand, nobody turns into a perfumer after my intensive courses, but they will be fully aware of where to start their own journey, and I am often surprised with truly inspiring creations from their side within just a few months after our classes. It makes me very proud! I don’t see or experience any difficulties while teaching, those people who are coming to me are hungry for information and can’t wait to learn more and more, so with this motivation, there is nothing impossible or even remotely difficult! My advice for those who don’t want or cannot invest time/energy/money into courses is to simply read a lot about perfumery. There is a lot of information available for those who search for it. So just read and sniff as much as you can! In your 2013 Fragrantica interview, you were asked your opinion of modern/contemporary perfumes and gave what I’ve always thought was a wonderfully honest response: “While some of the fellow niche perfumers’ works amaze me, having had valuable experience in creation—I can tell by a sniff an approximate cost of a perfume—it makes me sad to see that some niche companies are not selling original creations, but twisting already existing classic perfumes and they add a high price tag.“ Without necessarily naming names, can you elaborate further on what you see as the re-twisting of existing classics, and how some niche brands aren’t really putting out original creations? Do you think a lack of imagination that is to blame, or is it simple laziness, convenience, or greed? I still find gems of creations and really inspiring juices among traditional and niche perfumes as well, but I think there is an alarming amount of new niche brand that are created by brand owners who are not perfumers themselves. It’s not about going to professional perfume school or not. It’s about working to know the field and learn about the materials. Recently, I heard a self-claimed perfumer actually brag about never studying perfumery! And often I see creations done by my perfumer friends “in the shadow,” but all the credit goes to the brand owner who does not actively communicate or work on the scent. Real perfume creation is not only about “put some more patchouli in it” or “make this juice sexier”. This is degrading for real perfumers, who follow years of studies and practice to actually become qualified to make perfumes, but also for the people who really invest in gaining knowledge and learning about the field on their own. Your answer went to state: “Also, multi-nationals taking over some old niche house will just really change the old charm and authenticity. Unfortunately, as a result, the customers are getting just as lost with niche perfumes as they got confused with mainstream launches.” This prescient answer was in 2013, far before the 2014 Estée Lauder/Malle/Le Labo acquisition and the 2015 Puig one. Beyond the multi-nationals and a loss of authenticity, what other dangers do you see for the particular character of niche perfumery? I am not sure what further effect it will bring to niche perfumery, I guess we will see quite soon! Finally, you have consistently advocated that perfumers should stop shrouding what they do in mystery. In the 2009 newspaper article, you said, “The whole aim is not to idealize what a perfumer is doing.” In the 2013 Fragrantica interview, you added, “I do believe a lot in the education of the customers, though, and I do think we should allow them to have a deep look inside our work.” When I interviewed you in 2013 after visited you in your Paris studio, you told me that, “I think some brands are totally mystifying perfumers on purpose for the public. They say the magic goes away if people find out about the small details of our work, I disagree, I think the magic starts whenever they are let to have a look behind the curtains!” Are there some brands more than others that believe in mystifying perfumes, and in what ways do they do it? In general, why are the big perfume houses so scared of letting people behind the curtain? It’s not as if a novice could recreate the perfumes from some simple explanation, and I’ve noticed that people seem to think there is more magic when they understand just how much work is involved. So what do you think is the industry’s real reason in obscuring what they do? One of the main reason is still the confusion around aroma molecules. It is still a taboo for big perfume houses! People are shocked when they hear that there is like 0,00001% of pure natural perfumes in the market. And they are even more shocked when I tell them that most probably they would not like those all natural perfumes. Once I was invited as an expert to a perfume show, where I had to talk about the different creations, and naturally I went on to share interesting facts about each molecule. Afterwards, the organizer took me aside and told me that I should really not talk about the fact that these scents are made partially with molecules, as this will scare the customers and eventually have the opposite effect than promotion. I never got invited to that event again, but I would refuse anyways not to talk openly about the actual compositions of perfumes. I simply cannot pretend that something like a pomegranate scent is made from the actual fruit! If you’re interested in learning more about Viktoria Minya and her creations, you can read my review for her lovely Hedonist or my 2013 interview with her regarding perfume creation, IFRA/EU restrictions, and her life as a “nose.” Her website, Parfums Viktoria Minya, lists her perfumes, but also offers perfume classes or bespoke services. Some of the many Minya retailers include: Luckyscent, Twisted Lily, the NL’s ParfuMaria, Hungary’s Neroli, and Das Parfuma-Klima. For other retailers in Europe, as well as a few in Asia and the Middle East, you can look at her Retailer/Boutique list. This entry was posted in Parfums Viktoria Minya, Perfume Profiles or Interviews and tagged Fragrance Industry, Grasse Perfume School, How to become a nose, how to learn about fragrances, How to Make Fragrances, IFRA/EU Regulations, Parfums Viktoria Minya, Perfume classes, Perfume schools, Viktoria Minya by Kafkaesque. Bookmark the permalink. Wow, this is a most enlightening post. I will have to read it again to assimilate all it encompasses. Thank you for sharing. You’re very welcome. I’m glad you found it as informative and eye-opening as I did! An interview with a niche perfumer? Splendid! Wonderful write-up on an interview with a perfumer whom I have to admire for her wondrous Hedonist. I especially like how you posed intimate questions to her, such as her personal experiences in Grasse and through bespoke perfume classes (her account with the French actress is an eye-opener). Equally intriguing are her responses: they don’t sound like the ones I always hear from official press releases or something. On top of your great reviews as always, I’d love to see more interview write-ups from you again. Can’t help but wonder who else can you interview next. She’s definitely unlike some others in the business, and truly a breath of fresh air! I’m glad you saw how her responses differed from the canned, fake, and/or pretentious responses you find in so many press releases. In terms of interviews, I’ve done a number in the past, ranging from Serge Lutens to AbdesSalaam Attar, Papillon’s Liz Moores (who gave equally candid, informative, and revealing answers), Patricia de Nicolai, and Mandy Aftel. Also, another one with Ms. Minya herself after I visited her studio in Paris back in 2013. You can find them all by clicking on the Profiles/Interview link at the end of this interview to be taken to that section, or simply look somewhere within Blog Features header on the top of the page. All the interviews have the same style of (long) questions, lol, mixing topics from the personal to the creative and wider industry-related issues. What a fascinating – and charming – piece! Thank you so much for posting! What a wonderful interview. Thank you, Viktoria and Kafka! I really love Eau de Hongrie, btw. It’s nice to find out what a lovely and thoughtful person you are, too! LOVE the photos of the customers with the scent stickers on them – SO intriging. And lastly, I will admit to jealousy whenever I read about someone going to GIP, having the knowlege of it to seek that out, and then succeeding – WOW! Sounds like you’ve really followed yours dreams and your nose your whole life – good for you!! What a great informative post! Love the picture of the “organ” from above. I love Hedonist and have considered the iris as well. There is something so warm and welcoming and rich and classy in her scents that I assumed was a part of her. And it seems that way. Maybe one day I could do school on Grasse….Thank you Viktoria and Kafka! I love her creations, but besides being one of the best perfumers of our time, she is one of the best teachers you can ever find. I took an intensive course with her and has been the best investment I ever did. My creations changed completely after her lessons. Really wonderful article. I love Viktoria’s creations. I own her Hedonist Iris and it’s fantastic. I managed to drop the bottle and the sprayer broke off but you can still hold it upside down and shake the drops of perfume onto you. I can also get it out with a syringe. Ricky, perhaps you can write to her and see if she has any solutions for the sprayer other than you using a syringe? That sounds like a rather frustrating process. This is an amazing interview, Kafka. It was very informative and I loved Viktoria’s honesty about aroma chemicals and the internal process perfume companies use to create commercial fragrances. Big thanks to you and Viktoria! I’m so pleased you enjoyed it! I loved her honesty, too. What a wonderful and inspiring interview. Glad she is so open about the perfume industry. I am new to the world of perfumery, and I happened to stumble upon your blog, specifically this interview. Your questions were candid, and multifaceted, yet respectful. I feel like Viktoria was drawn in by you as much as you were by her! Thank you for this interview and this whole blog. I love it! Incredible what goes on beyond the making of perfume, especially the big perfume houses etc..so much hidden. Shame. Thank you, Dorje. As a side note, it’s nice to see you again, and twice in one day, too. 🙂 How have you been? Discovered any new loves lately? I hope you’ll feel free to pop in again from time to time. It’s always lovely to chat with you.